Amelia snuggled a lot with my sister-in-law Patsy, who came and stayed the week after I got out of the hospital to help out. We miss her! Amelia really is so huggable. 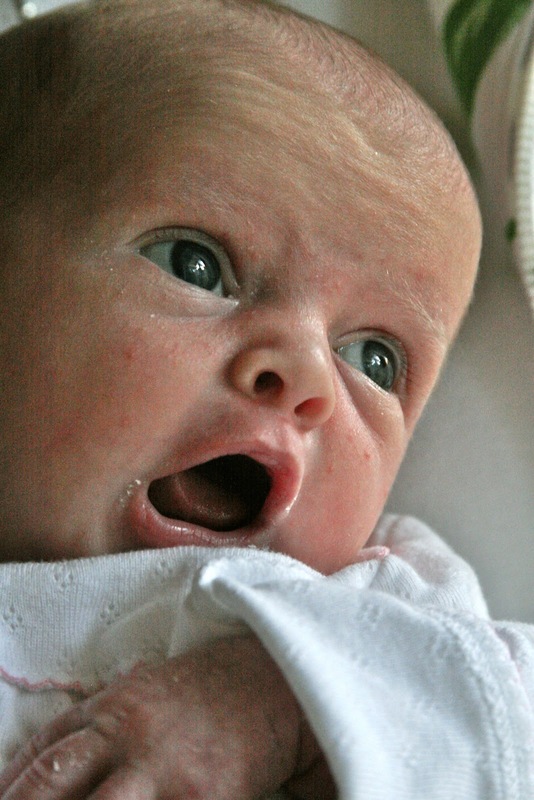 Her eyes are bluer than Nathaniel or Nick's were at 1 month old ... more like Jake's, which have remained bluish-grey. Amelia is a Champion Rooter. If it's anywhere near time for a meal, she's rootin' around. And if you wait too long, she'll let you know she's overdue. She doesn't take a paci all the time, but she likes to have one some of the time. She's a doll and I can't get enough of her. I had forgotten what one of those sweet toothless grins looks like! Around here, a 'toothless' grin means you are missing your top four, just waiting for the new ones to finally come in! What a precious little girl - thanks for sharing her with us! She is beautiful! I am really curious about how you schedule her. Please fill me in! OH my goodness, she is sweet!